The acquisition of safe drinking water for early Greeley was no simple task. Discussions began in early 1883 when G. Law wrote to the Greeley Tribune suggesting that a well providing potable water could be constructed in Greeley with “little effort”. Attention at this time had been long focused on the success of the West Denver artesian well. After a few Greeley residents became ill from Greeley surface water due to its high sulfur content, petitions signed by roughly 100 taxpayers were presented on June 4, 1883 to approve drilling a similar artesian well. 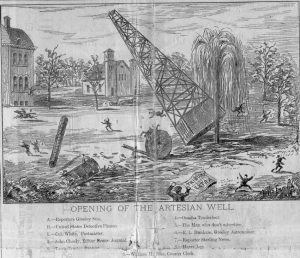 There was no known opposition to the construction of the artesian well, and it was completed in April, 1884 at the south end of Lincoln Park, contracted by the Swan Brothers. The originally agreed upon depth of 880 feet proved unsuccessful in reaching water, so the City chose to renew the drilling contract. The drilling went forth with much labor and difficulties, crunching through hard and soft layers of the earth and producing all sorts of interesting soils and fossils. Tools were lost, drills broke and water seepage became somewhat of an issue. However, success was achieved and water was struck at almost 1200 feet. A large can filled with nitro-glycerin was used to “shoot” or conduct the final opening of the artesian well. The newspaper humorously stated that boys and men were rushing to the well site when it was dangerous, but were getting out of the way when the danger of the “shooting” had passed. Immediately following the opening, a column of water shot up, and an increased flow resulted. The Greeley Tribune printed an image of this exciting event, depicting the destruction of the derrick by the blast and the surprise of all characters nearby. Greeley’s first artesian well water was chemically pure except for the presence of free carbonic acid. Jesse Hawes, a local doctor, stated that this made the water have “a life and sparkle that is delicious and healthful.” A man by the name of Eli Hall claimed that he had not had a good night’s sleep for ten years until he began drinking the medicinal waters of the artesian well. Greeley citizens saw the well as a success in light of the belief that the water had medicinal properties. Entrepreneurial boys soon spent Saturdays hauling water from the well to households for ten cents a tub, although competition quickly lowered that price. 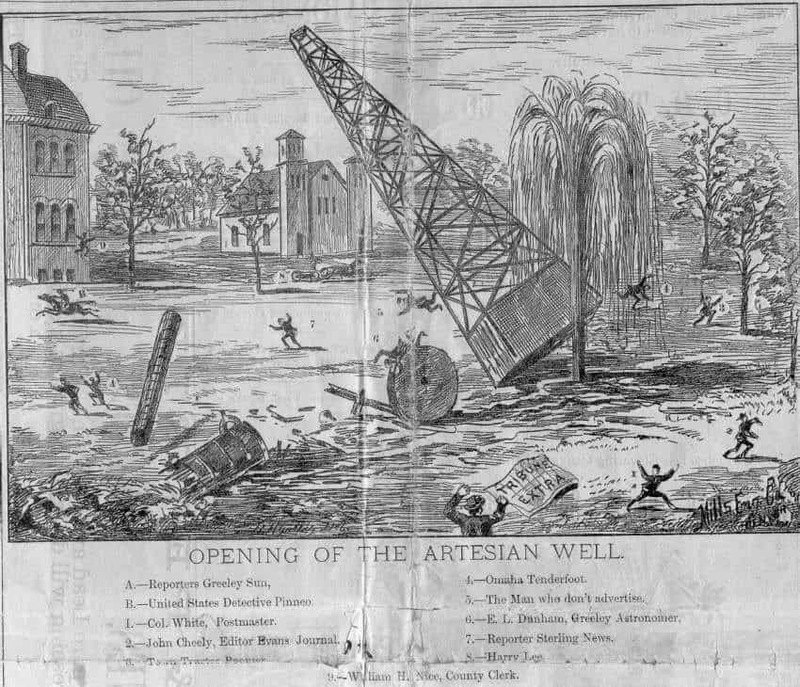 When water began to be routed from other sources in Colorado, the Lincoln Park artesian well was abandoned. The Greeley Tribune raised the money to erect the rock structure that is presently at the old well site, and is now fondly called Pioneer Fountain. 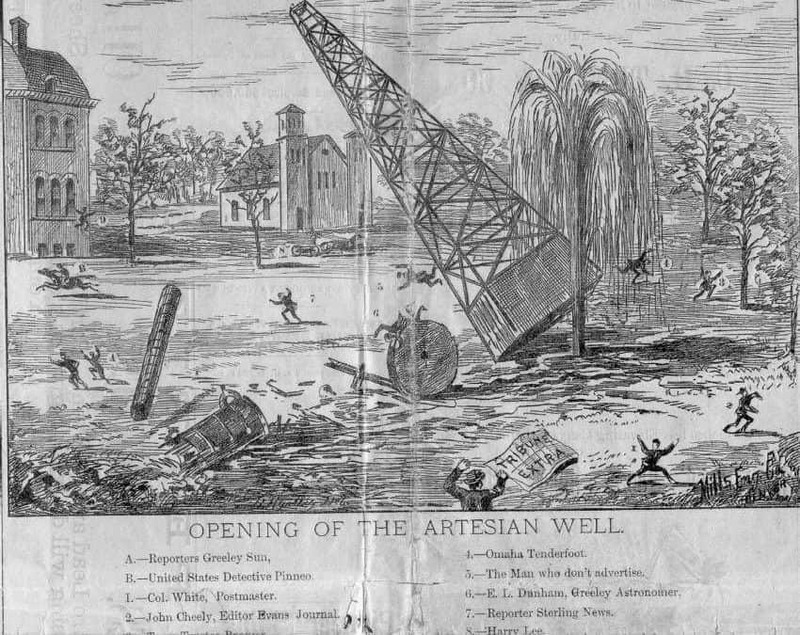 The shooting of the artesian well. City of Greeley Museums Permanent Collection, AI-0008.